Published: Oct. 27, 2015 at 08:07 p.m. Updated: Oct. 30, 2015 at 01:09 p.m.
No one is going to accuse Kirk Cousins of not striking while the iron's hot. The Redskins quarterback became a viral sensation Sunday night when a Vine video surfaced of Cousins shouting, "You like that! You like that!" at a D.C.-area reporter following Washington's 31-30 comeback win over the Buccaneers. 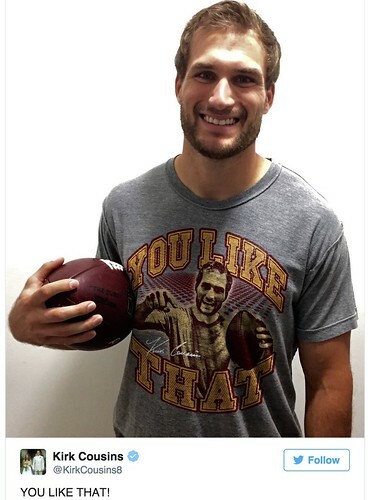 Just 48 hours later, Cousins was hawking T-shirts of his image and suddenly ubiquitous catch phrase. America. That's right, for just $22.99 ($39.99 if you want to splurge on the hoodie) you can announce to the world, "Hey, remember that one thing that people laughed about on Twitter last weekend? Here it is again!" Proceeds go toward the International Justice Mission, a global organization "that protects the poor from violence in the developing world," according to the website. 428 shirts had been purchased at of 8 p.m. ET, pretty damn good considering a goal of 500 sales had been listed on the site. Let's hope this merch has a longer shelf life than your "Got rg3?" T-shirt.